There's no reason to camouflage your event! 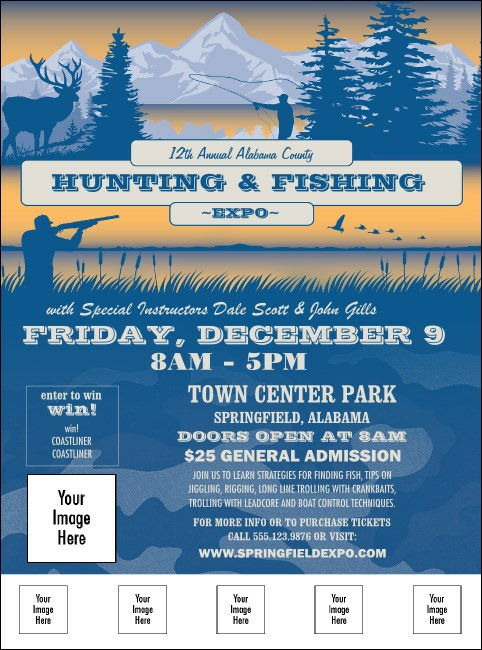 Choose a Fishing and Hunting Expo Flyer template with space for you to upload custom photos of your vendors and exhibitors and has plenty of space for your information. With images of a hunter, fisherman, ducks, and mountains this Flyer helps you take aim at your sales goals. You don't need to go hunting for a great design. Check out TicketPrinting.com's gallery today.